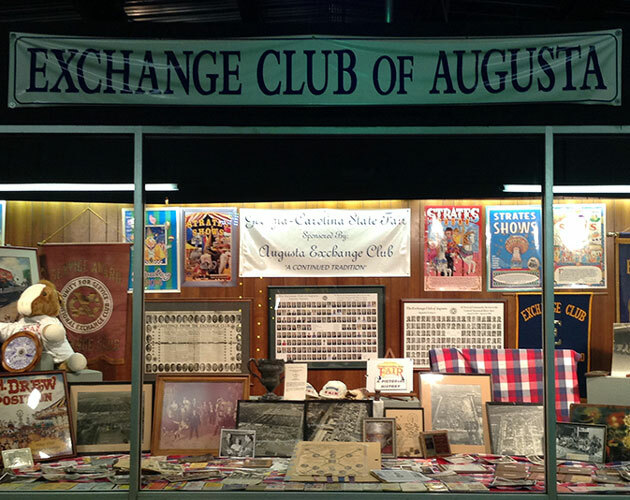 The Exchange Club of Augusta was established on August 8, 1923. In October of that year, the club sponsored its first Exchange Club Fair. 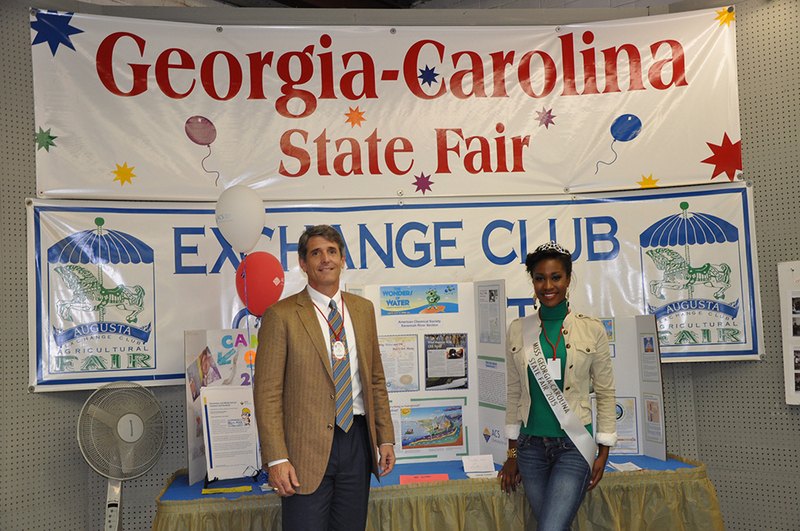 Since that time, the Exchange Club Fair, now known as the Georgia-Carolina State Fair, has been an annual event sponsored by the Club for the purpose of raising funds to be donated to well deserving charities throughout our Community. During these years, good and bad times have been endured by the Club. Sponsoring a Fall Fair is risky business in that the weather can greatly affect the revenues of the fair. Without these revenues, the Exchange Club would be unable to donate the funds that it does to the various charities throughout the community. Realizing this, The Exchange Club of Augusta established the Augusta Exchange Club Charity Fund. The Augusta Exchange Club Charity Fund insures the future ability of the Exchange Club of Augusta to donate generously to the community. This fund is designed to withstand years of decreased Fair revenues which could be caused by a variety of reasons. This tax-exempt organization is operated by persons who function independently from the operation of the Exchange Club itself. The donations from the Fund are made to tax-exempt charities in the Augusta area. Tax Exempt Donations should be made payable to the Augusta Exchange Club Charity Fund, Inc., and mailed to the below address. Each year the Augusta Exchange Club is proud to put the proceeds from the Georgia Carolina State Fair and the Augusta Charity Classic Golf Tournament back into our community. The donations are awarded at our annual Donations Meeting and Community Partner Recognition and Media Sponsor Appreciation Luncheon. Representatives from the charity organizations are on hand to accept their donations. Each year the amount well exceeds $180,000. As part of these donations, one charity receives the Ronnie Strength Award that is selected by the current Sheriff. The recipient is unaware until the announcement by the Sheriff. 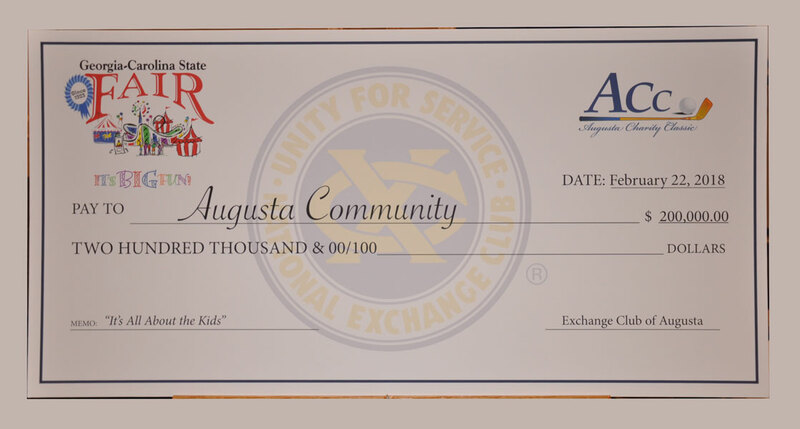 The Augusta Exchange Club is proud of the contribution they are making to the this community. We are also grateful to our Community Partners, Sponsors and Media involvement. The Youth of the Month / Year is an award presented to those high school seniors who have demonstrated exceptional achievement and leadership in the areas of Academics, School Organizations, and Community Service. Academics is based on Grade Point Average. School Organization participation includes Student Government, Musical Organizations, Debate Teams, Stage Productions, and Athletics. Community service includes volunteer work the students have done for Community Service Organizations such as The Red Cross, Hospital Volunteer Organizations, Benevolence Organizations, etc. Students are also graded on Special Achievements/Awards that they have received on the local, state and national level. Each student is required to write an essay on a subject that is selected by the National Exchange Club which they are also graded on. Points are awarded for each of the above categories to determine the winner of the Youth of the Month award. The Augusta Exchange Club solicits candidates from each of the high schools in both Richmond and Columbia Counties. A winner is selected as Youth of the Month from each of the schools participating. From these winners, the Youth of the Year is selected. Each Youth of the Month is awarded a plaque and $100 in cash. The Youth of the Year is awarded a plaque and $350 in cash and represents the Club at the District and National levels where additional Scholarship Funds are awarded to the winner. Best of luck to all of these deserving young people in their future endeavors. The A.C.E. award recognizes high school students who have made a dramatic change in their attitude and performance sometime during their high school years, and are now eligible for high school graduation. These “at risk” students have often ovecome great physical, emotional and social obstacles, yet few receive recognition. The primary focus of the National Exchange Club, of which the Augusta Exchange Club is part, is the PREVENTION OF CHILD ABUSE. Every year Child Protective Service agencies investigate more that 3.25 million reports of child abuse and neglect. Child abuse can come in the form of physical, emotional, sexual or just plain neglect. The Augusta Exchange Club is proud to be involved in this National Program of Service on the local level. The majority of contributions by the Augusta Exchange Club to charitable organizatons go to agencies directly or indirectly related to the Prevention of Child Abuse.